Marinating in yoghurt or quark before cooking both tenderises and moistens as well as giving the meat a lovely coating and flavour. Quark is a Continental cheese, a fat free cross between fromage frais and a cream cheese. We have been using it for baking, to top porridge or cereal, adding a dollop to smoothies – it is relatively high in protein so fills me up. The latest use is for marinating chicken for kebabs. Until recently most Quark for sale in the UK has been imported, but there is now a British brand of Quark that I buy and use – read more here. My top tip for perfectly cooked kebabs is to start them in the oven, and then finish in a pan, griddle or on the BBQ. Cooked all the way though with just a little browning. If you try this Quark (or Yoghurt ) Marinaded Chicken Tikka Kebabs please tag #FussFreeFlavours on Instagram or Twitter. It is amazing for me when for me when you make one of my recipes and I really do love to see them. You can also share it on my Facebook page. Please pin this recipe to Pinterest too! Thanks for reading Fuss Free Flavours! 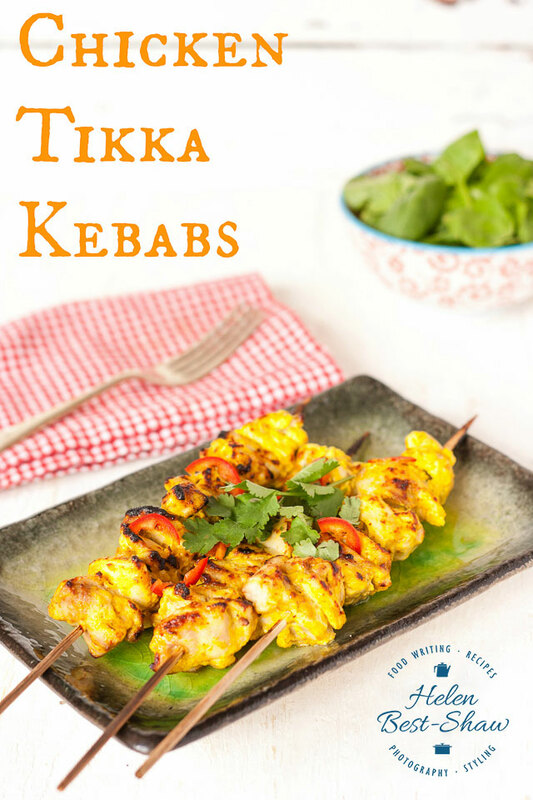 Quick & easy, fuss-free lightly spiced chicken tikka kebabs are a quick meal to make when you have some chicken and quark (yoghurt) around! Mix the quark and the spices together. Stir in the chicken pieces, cover and leave in the fridge for at least 2 hours or overnight. An hour before you want to cook soak 4 wooden kebab skewers in water. 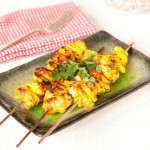 Thread the chicken pieces onto the skewers, and bake in the oven at 170C / GM5 for about 20 minutes until cooked through. Then fry, griddle, grill or BBQ for a minute or so to give some grill marks. Serve garnished with slices of chilli and some fresh coriander.